So you’ve had a successful prospecting call, and now you’ve got a client who’s eager to work with you. Congrats! But now excitement has given way to dread because they’ve asked you to send a proposal for them to review first. In some ways, a proposal can seem like it’s just a piece of paper, a mere formality. But the truth is, it can make or break your budding relationship with this potential client. The proposal outlines everything you’re going to deliver to them so they can rest assured they’re getting exactly what they’re going to pay you for. Even if they’ve said yes over the phone, the deal’s not done until they’ve signed on the dotted line. And the only way to get them there is to send a consulting proposal they can’t resist. Here’s exactly how you’re going to do that. Before you start writing a consulting proposal, there are a few general guidelines you need to make sure you’re following. 1. Get them on the phone or meet in person first. Only send a consulting proposal after you’ve had a successful initial phone call or meeting with the prospect. If someone’s asking you to submit proposals blindly, the chances of yours wowing them are very low. While a consulting proposal can be a powerful tool for winning clients, it’s not the only one, or the first one you should reach for. You should do your best to get your prospect on the phone—or, even better, meet them in person—before you even talk about submitting a proposal. Hearing your voice or seeing your face will do wonders for your prospect in terms of trust. Note: There are times when a company will put out a Request for Proposals(RFP) during which anyone can submit a proposal, and there likely will not be any contact with the company beforehand. Obviously, in these cases, competition is fiercer and your chances of winning are lower. 2. Fully understand your potential client’s true desires. Before you write a word of your proposal, you need to understand your prospect’s true desires. It’s not just about what they tell you they want (e.g., a new website). You need to dig deeper to find the motivation behind the project (e.g., a new website for them to showcase and sell their artwork more efficiently). BONUS: When writing your consulting proposal, try to reflect the exact words you keep hearing from your client when they discuss what they want. Why? Because it shows you were listening to them and that you understand. There’s even a psychological phenomenon known as the chameleon effect, where one person mimics the other to gain empathy. It occurs in social situations where people are trying to build rapport and, interestingly enough, is the reason some people pick up the accents of the places they travel to or live in. We try to be like the people we like! 3. Get as specific as possible about the value you’ll provide. 3. Properly evaluate the scope, timeline, and value. This is probably the hardest part of writing a consulting proposal if you’re new to it. The two best ways I’ve found to properly evaluate project scope, timeline, and value to the client is through sending an initial client questionnaire and then following that up with a phone call. By doing these two things, I can gather all the data I need, both in writing and in verbal communication, to figure out just what’s at stake in this project. 4. Be open to making mistakes. If you’re new to consulting or freelancing, you probably will make mistakes when it comes to evaluating scope and timeline. This is because, often, you won’t really know how long things will take you due to lack of experience. That’s okay! As you write more proposals and gather more data about your workflow, it’ll get faster and more accurate each time. Be open to making mistakes; you’ll learn quickly from them. ATTENTION: Want to learn how to write a million-dollar proposal? Sabri Suby walks you through the exact steps he took to scale from a bedroom-based consultancy to a $10 million agency, in our course Consulting Empire. If you want to learn how to start, grow and explode your own consulting, freelance or coaching business and create winning proposals, click below to get more info on the course! Yep, if you want to keep it low cost and no frills, you can simply fire up Microsoft Word, Google Docs, or any other word processor, and type up your proposal. One of the upsides of using Google Docs is that it comes with some project proposal templates. Just open up Docs and select one from the Template Gallery. From there, either you’ll have to print it and get it signed in person, or you’ll have to email it and get it e-signed using other software. Again, if you want to keep your expenses low, you can create the proposal in a word processor, export it as a PDF, and then attach it to an email to your client. DocHub makes it easy to get your documents e-signed. I’ve been using it a lot lately because I really like one particular e-signature feature. DocHub texts you a link to a webpage where you draw your signature with your finger on your smartphone’s touchscreen, and then it saves that image to the online version of DocHub. You can then “stamp” your signature onto any online document. If you use the free version, you can send up to three documents for e-signature per month. Any more than that, and you’ll need to upgrade to DocHub Pro, the paid version. Another great free option, with more bells and whistles than a word processor, is AND CO. It allows you to draft proposals and contracts (it has templates for both! ), which you can then email to your client via its platform. As a bonus, you’ll get email notifications when your proposal is viewed, and your client can e-sign and pay you online. Honeybook is paid software that lets you create proposals, send them for e-sign, get notifications when they’ve been viewed, and accept payments online. Bonsai is another paid software with proposal features that are similar to Honeybook. You can create proposals, email them for e-signature, receive notifications when they’re viewed, and get paid online. They also have many templates to choose from, such as this freelancing proposal template. Simple yet powerful, Better Proposals is paid proposal writing software, popular for its web-based interactive and trackable proposals with beautiful, modern design. You’ll get notifications when your proposal is viewed and e-signed, and you can get paid online. Among their 100+ free templates, you can find the consulting proposal template too, which helped consultants win over $38,000,000 of business in 2018 alone. Now, this is the part of the document where you want to be ultra specific. That’s because, if later on in the project that dreaded “scope creep” rears its ugly head, you’ll have this document to point to that clearly outlines what you will (and will not) do for the proposed fee. So, if you’re being hired to write for a client’s blog, be sure to outline how many words you will write, how many revisions are included, etc. Or if you’re being hired as a life coach, specify how many coaching calls are included, how long each call will be, if there will be any email support allowed, etc. You don’t want there to be any room for confusion here, or you might lose out on time and money. Similar to scope of work, you might also find it necessary to outline deliverables, which are basically the identifiable end products you will be “delivering” to the client. There can be a lot of overlap here, but the difference between the scope of work and deliverables might be best explained with an example. Let’s say you’re a freelance copywriter being hired to write an ebook to generate leads for a company. Your scope of work section might include things like learning more about the company’s brand, researching competitors, writing the ebook, and revising it. Your deliverable, however, might be a 10,000-word ebook, fully formatted and delivered via Google Docs. A good consulting proposal manages expectations so no unwanted surprises pop up. Part of that requires outlining when you expect to complete the project. Are there any milestones in between? On the latter point, with long projects it can be helpful to have checkpoints of completed work. This can help you manage your time and build confidence in the client that things are going as planned. You can also use milestones to release partial payment of funds. Just be sure not to pin yourself down with too many milestones, to allow some flexibility in your workflow. Make it clear what your fees are and what they include. Also, specify due dates, accepted payment methods, and payment terms. For example, if you require a 50% initial payment, make sure you clearly state that you will not begin work until the client has submitted the first payment. This section of a consulting proposal isn’t that popular, but I personally always include it and find it important. Many times, when there are delays on consulting projects, the bottleneck lies with the client. For example, every web developer knows the pain of being stalled on a build because they’re waiting on content from the client. If there is any part of your job that could be stalled through no fault of your own, make sure to list it here. For instance, if you need to interview the client in order to write their bio, be sure to list that here. That way, if the client keeps dragging their feet on scheduling the phone interview, thereby making you late on your writing deadline, it’ll be clearly outlined here that you were expecting an interview from them in order to complete your work promptly. I don’t personally use this section, but I’ve seen it in other consulting proposals and can see why it would be a good idea. While I believe you should “pitch” yourself on why they should choose you before you submit a proposal (such as on your website or during the initial phone call), this would be a great place to reiterate those points. That’s especially true if you’re applying cold to an RFP. Again, this isn’t a popular section for consulting proposals, but for me, it’s a must-have! Putting an expiration date on the proposal protects you from having a prospective client come to you three months later wanting to accept your proposal. As you know, by that time, you might be fully booked or your prices might be higher. A client can’t reasonably expect you to drop everything and fulfill the project in your proposal if they don’t act quickly. That’s why I strongly recommended telling the client when the proposal will expire. You’re almost done! Now, you need to wrap up your consulting proposal and leave your prospective client feeling like they must hire you. Some consultants will send over a proposal for the client to sign and approve first, then will send over a separate contract for the client to sign. I prefer to save time and energy by having my proposal serve as a contract too. If you choose to make yours a proposal/contract combo, add any terms and conditions here. Common ones include cancellation, payment terms, and an independent contractor clause. If you need help, AND CO has this awesome free contract generator. You can also get a freelance contract generator from Bonsai. Finally, this is the part of the consulting proposal that both you and your client will sign and date to approve and agree to everything that was stated in the proposal. Now that we’ve gone over the steps to creating a consulting proposal that’s stellar, it’ll be helpful to see real-life examples. Below, I’ll share some good consulting proposal examples and what makes them special. You can click each one to get the full details. This public relations proposal template from PandaDoc showcases a strong introduction. (Keep in mind, though, yours needn’t be this long.) It starts with addressing the client and their needs, outlines the PR consultant’s unique experience and how that will help the client, and then closes with expressing confidence in the consultant’s abilities. Get the full PR proposal template here. This interior design proposal from PandaDoc combines the Scope of Work and Timeline into one easy-to-read table. Get the full template here. 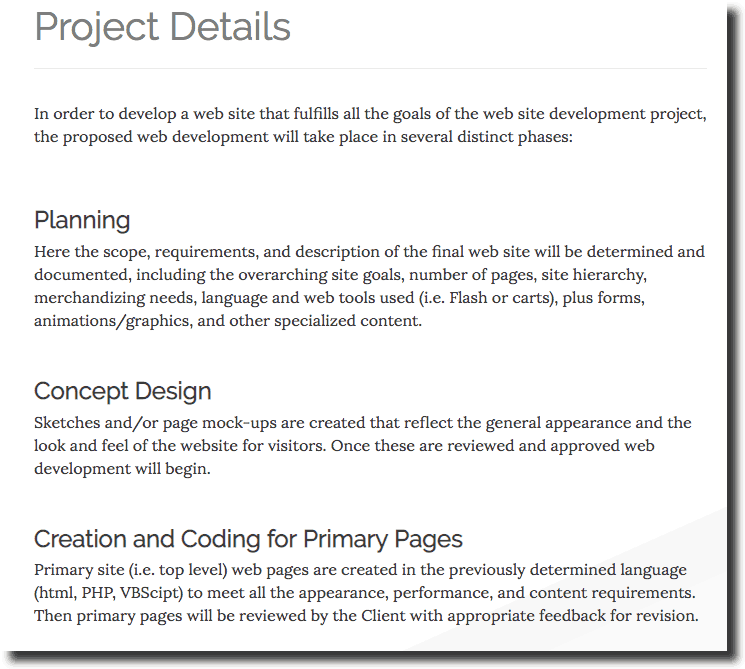 This web design proposal template from Proposable displays the difference between the Scope of Work section (here, called “Project Details”) and Deliverables section. While the scope of work will include things such as determining the site hierarchy, creating page mock-ups, and coding the site, the deliverables are a fully functional website and a WordPress feature that allows the client to add blog posts. You can get the free web design proposal template here. The following is a screenshot of a free template from Bidsketch. This is the section titled “Recommendations for Your Company.” Using bullet points, it clearly outlines the services the SEO consultant will provide. You can get the free SEO proposal template here. This is an excerpt from a free template from Proposify. I like how they broke down the fees in the “Your Investment” section and clearly outlined the terms of payment (“A deposit of $2,000 is due upon signing”). You can find the free content marketing proposal template here. When in doubt, keep it simple. Some of the examples I shared in this post have colorful designs and even photos included—I’ve never done any of that. I try to keep my proposals to one or two pages and create them in Google Docs. Expect negotiation/requests for edits. It’s extremely common for a client to want to ask questions about the proposal or even edit it. That’s okay! Be open to negotiation, and don’t worry if the proposal needs to go through a couple of rounds of edits. Follow up, no matter what. If you send the proposal and hear crickets, don’t panic! Follow up in an email to the client and ask if they have any questions or would like to hop on a call. Often, a client will need to carefully review the proposal, share it with colleagues, and discuss its contents, so it might take some time. That’s why, as I said before, you should put an expiration date on your proposal so things don’t drag on for too long. When drafting your proposal, consider where your client is now and where they want to be. Think of your proposal as the plan that outlines how you’ll get them there. Do this, and you’re one step closer to landing your next consulting client! Do you have any tips that have helped you craft winning consulting proposals? Share the knowledge with your fellow entrepreneurs by leaving a comment below!